Winter isn't quite here for most of us, but it is a good time to think about toys and gifts for the snow. These can be holiday gifts, birthday presents or just because it's a snow day! When I was young, I couldn’t wait for winter! It never really mattered how cold it was outside, I just wanted to play in the snow. Whether it was sledding, tobogganing, building a snowman or having a snowball fight with the other kids, I just wanted to be outside! If you have fond memories like I do of playing in the snow when you were younger, you want your children to experience this same fun. You also want to be sure your child is playing with a fun, but safe winter toy. Since winter is only a few months long, let’s take a look at a few inexpensive but fun toy options available today. Snow Tubes are an awesome winter snow toy and they cost less than $8! Light enough for kids to carry, but durable enough to hold up to plenty of down hill slides, snow tubes are definitely a toy to take a look at for winter fun. Love to toboggan? Do you remember trying to drag that heavy toboggan up the hill? Boy I do! It was almost too much work to try to get up that hill for a 30 second ride – but what a ride it was. Today, there is a lightweight toboggan that your kids (and you) are sure to love. The lightweight Blizzard inflatable toboggan is easy for kids to carry, but manufactured of thick, heavy vinyl for durability. Winter fun for 1 or 2 people or kids with a price less than $20. Snow sleds are another fun winter toy – but they can also be costly. If you’re not looking to spend $100 or more on a snow sled, the Summit snow sled may be just what you’re looking for. Heavy duty with hand grips, this inflatable snow sled will have you and your children flying down the hills. Cost is less than $20. How about a winter toy that does double duty as a summer toy also? Almost two toys for the price of one – now that’s smart shopping. The Ski Storm inflatable Jet Ski is a great ride-on sled for a kid that does double duty as a pool toy in the summer. This toy is made quite well of durable vinyl and patented Weathertek for year-round fun and priced less than $25. 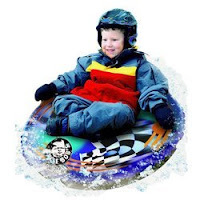 Are your kids ready to try a snow board, but you’re not ready for them to do so? The inflatable rocket ranger snow board is a great way for them to learn how to snow board. This snow board is made of sturdy vinyl with 2 built on boot straps, can hold up to 120 pounds and is recommended for kids 6 – 12 years old. With a price tag less than $10, this is a great way to determine if snow boarding is really what your children want to do. Don’t forget the accessories that make your life easier – and safer. Snowboarders should wear protective gear such as helmets and today’s air pumps are affordable and won’t leave you gasping for air. Outdoor toys that are affordable but fun are the way to go this winter season. diverse catalog of toys to play outdoors. Our winter toys like snow tubes, snowboards, and snow sleds are inexpensive as well as fun. You might notice the widget in the side bar that goes through various products ("WidgetBucks"). Originally it was set to sense the content on the page automatically but just went through video games. I've now set it to display "US made lead free toys", which I thought was an interesting category. Here is the list of top selling toys at Walmart.com over the last seven days. 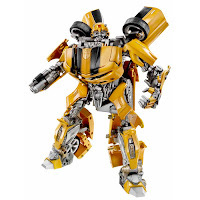 There have been a couple of changes since last time - Hot Wheels has entered at number one and another Transformer has entered the top 10. Interesting that there is little or no overlap with the Amazon Top 10. It'll be interesting to see how this changes as we get closer to Christmas. Looking for what will be a hit with the kids this Christmas? Well, Amazon.com's best seller list might help you! This was their top 10 on October, 23. Although merchants and advertisers would have us believe that kid's tech toys are king this Christmas, many parents, grandparents, and gift givers long for the simplicity of a low-tech Christmas featuring the classics that we remember from our own childhood - wagons, toy trains and transportation, simple building blocks, and high quality children's furniture that facilitates pretend play. Many adults want to give gifts that are made of high quality materials that will last, be loved for generations to come, and be passed down to the recipient's own kids. 1. 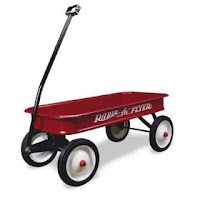 Radio Flyer Classic Wagon: This is the classic red wagon that most of us remember from our childhood. It's flared edge is what stands it apart from competitors and makes it recognizable. (The design is trademarked). This item has been in production for over 30 years and is in the Parents Magazine Hall Of Fame. It retails for about $65. Considering it will be used for years, this price tag isn't a bad one. 2. Classic Wooden Train Set: Every child needs a classic wooden train set. Children love making trains go over the bridge and around the town while pretend-playing situations for the passengers. Most sets come with bridges, houses and people/figures to encourage pretend play. Prices vary depending on the number of pieces and accessories. 3. Classic Wooden Kitchen: You see these little kitchens in almost every preschool and nursery today, but unfortunately most are made of plastic that absorbs spills and debris and stains horribly. Look for a large, wooden kitchen with a removable sink (so it can be cleaned) Cabinet doors that open and provide storage for kitchen supplies or can function as a pretend oven is a huge plus. Wooden kitchens run about $150. 4. Classic Wooden Building Blocks: Wooden building blocks should be required in every playroom. Not only do they encourage mobility and fine motor skills, they are also wonderful for pretend play and role playing and the combinations and possibilities are endless. Blocks challenge children to make the visions in their mind a physical reality. This is important for both problem solving, troubleshooting and imagination. Basic wooden block sets start at about $30 and are priced based upon the number of blocks and how elaborate the set is. Some incorporate transportation or specialty buildings like castles or forts. 5. Classic Radio Flyer Bicycle: No matter how high tech our children become, they still love feeling the wind in their hair and the excitement of getting from here to there on a bicycle. This classic red, bike is the one you remember from your childhood and has the recognizable silver, steel bell as well as the stability training wheels. Retails for about $50. Christmas and gift-giving occasions provide the perfect opportunity to share your childhood with the children you love. With just a little searching, you can find many suitable retro, classic toys to share with kids who live amongst ipods and gameboys. Free shipping on select Toys through 11/3 at Target.com. If you're stuck for an unusual, affordable birthday present idea then look no further! Every child enjoys a new game or puzzle to play with and whether you're looking for something to keep little hands occupied while travelling, or a game for all the family to play there is plenty on the market to inspire and entertain. Look out for magnetic playsets which are ideal if you're on the move. Many come with handy travelling pouches too, great for keeping all the little bits and pieces together in one place. Make sure you find a puzzle or game with more than one challenge or solution so it's not a one hit wonder. Problem solving logic games are ideal for keeping kids and even the whole family entertained on journeys. Old fashioned word games/quizzes are still very popular and are another great idea which can be enjoyed as you travel together. Every child loves the independence that having their own set of luggage brings. There are some fun yet extremely practical children's luggage trolleys on the market that are a real hit with young travellers, such as kids character wheelie trolleys. Kids just love packing up their belongings and wheeling their own quirky friend around with them. Some children's luggage sets even come with matching dressing up kit for added travel adventure! Top tip if you are planning lots of travelling - many kids suitcases are big enough to foster independence, yet compact enough to classify as hand luggage - great news if you're in a rush at the airport! We all know fresh air is great for kids and if you're looking for an inspirational way to encourage outings whatever the weather then this is it. Children adore having their own brolly to put up, take down and just carry about with them. Look out for chunky, rounded handles to make carrying easy, a rounded tip for safety and nice rounded ends to each spoke of the umbrella. Gervase is a mum who is passionate about high quality, practical and affordable kids travel accessories. She and her husband run their own online independent shop specialising in childrens luggage and travel accessories including kids suitcases, childrens travel games, samsonsite luggage for kids, children's suitcases and children's luggage trolleys. All children's travel accessories featured on KidsTravel2 are tested and enjoyed by real children! Sometimes it's nice to return to the basics! Wooden toys still seem to be very popular. Here are a few wooden toys for toddlers and children that consumers have rated as excellent (5 stars). Product Description: "An innovative combination of magnets and wood, this dress-up set is sure to provide hours of imaginative play. Magnetic dress-up doll includes stand and loads of colorful, magnetic outfits and accessories for pretend play. 27 pieces. Measures 8.5" x 11.5" x 1.5"." You can subscribe to a free Newsletter that will not only give you gift ideas that Consumers have rated excellent but also tell you where you can buy them. 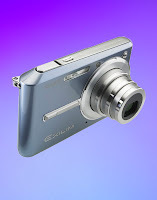 Go to http://www.top-10-gift-ideas.com for more information. An excellent article if you're buying a book for a child of a relative or friend. Books make wonderful gifts, but it can be hard to select the right book. As publishers of children’s books, we are often asked for advice on selecting a book for a birthday or holiday gift. Here are suggestions about how to select the perfect book to give to your niece, nephew, friend’s child, or grandchild. 1. Knowing age and gender does help. Now we know you may not remember exactly how old the child was at their last birthday, but being in the ballpark is useful. If the child is preschool age, you will choose different material than if they are in high school. Also, if you don’t see the child often enough to know about their interests, knowing whether you are choosing a book for a boy or girl can help define what type of book will be welcome. 2. Talk with the child’s parents. Ask about the child’s current interests, activities, or hobbies. Books related to what a child is doing make great gifts. You can find books specifically about the topic or books which incorporate the topic as part of a story. For instance, if the child is fascinated by snakes, you could choose a scientifically–oriented book with pictures and information about snakes or you could choose a story book featuring a snake. 3. Be sensitive to family values. Make your gift a happy addition to the family rather than a bone of contention. The most common issue is religious content. Most parents we talk to do not want books for their children which press any particular religious point of view. We have heard this from people of all faith backgrounds. Other content on which you would want to understand the parents’ position, or simply avoid, include level of violence, sexual content, and sexual orientation. These all tend to be areas which require a certain level of maturity to deal with and parents will know best whether their child is ready to deal with content like this. 4. If you have no clue, there are some topic areas that most children enjoy. Humor, fairy tales, and animal stories have broad appeal. Our experience indicates that Japanese manga (comic books) are very popular in urban areas of the US right now, but not nearly as welcome in rural areas. Manga varies wildly in content from “great for kids” to “strictly for adults”. Pay attention to what you select. 5. Ask for help. Bookstores often have a bookseller who manages the children’s book collection. This person is a valuable resource about the most popular books. They also will often know what choices might work for your situation. Having followed the tips above, you should be able to provide the bookseller with enough information for them to come up with several recommendations. Librarians are another good resource. 6. "Tweeners” are a challenge. There are lots of books for young children and lots of books for adults, but the in-between years of 10 to 15 years old can present something of a challenge. The books for young children are too childish for these budding adults, but the books for adults tend to have strong thematic elements which are not appropriate to this age. Our best advice for this group is to buy classics. Authors like Robert Louis Stevenson, Jane Austen, or Mark Twain, the Nancy Drew or the Hardy Boy series are all good possibilities. Writers from previous eras presented material differently. Using these suggestions, you’ll find great books to give to the children on your gift list. Celia Webb is an author, illustrator, and company executive. She and her husband, Mack H. Webb, Jr., founded Pilinut Press, Inc., publishing advanced readers for children and ESL students. 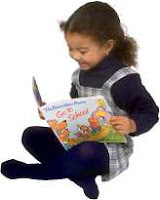 Their website http://www.pilinutpress.com offers more free articles on developing reading-related skills, word games and puzzles, and activity sheets for their entertaining and educational books. Here is the list of top selling toys at Walmart.com over the last seven days. Interesting that they are mainly for girls. Some suggestions for children's gifts. When shopping for children’s gifts and toys, look for something with a good return policy incase the child on your list receives a duplicate. NFL Lockers are a great gift for any boy’s bedroom or playroom. They feature the logo of the favorite team and a nameplate in a locker that can be a great tool to help organize the football fan’s bedroom. He’s going to love being able to look at his name on the official looking locker name plate and have a place to hang his things, store his football and other items as well as put things away in the compartment. This is a great gift! Floam is a fantastic item for a crafty kid. This stuff is made of small micro beads that you can shape and play with. 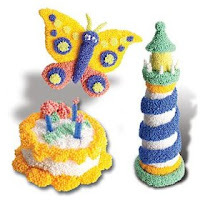 You can wrap Floam over other things, create shapes and animals and easily express artistic talent. It is removable, colorful and best of all, non-toxic. This is great children’s gift and toy for girls, especially. The TV Dance Mat is a hit for kids and adults. It connects to your television set and lets everyone play the popular dancing arcade game right in their living room or playroom. There are several games and songs and you can get really competitive while doing a great cardio workout! Many parents complain that video games keep their children sedentary but this game encourages calorie burning for anyone who plays it. The Pool Shark is another popular children’s gift and toy that can create a laugh at the pool or beach when the shark chases all the swimmers out of the water. Children’s Gifts and toys are everywhere. They’re not hard to find but you do want to find an age appropriate gift that that child on your list will like you can do a little bit of online research to find the perfect gift. If you are aiming to surprise someone with a gift and don’t know what to get, speak to other kids that age for some hints and tips. This article was written by Aiden Bigeon, to talk about how to choose the right gift or toy for a child. With this said, I would highly recommend visiting Taylor Gifts to find out more about a wide variety of toys and gifts for children. For coupon codes, discounts and free shipping offers go to Great Online Deals. This is great gift for the parents who want their child to learn a foreign language. Make Your Child's Birthday Party Fun! 1) The birthday party is about your child and his or her friends having fun, not the work that goes into the party. The major objective of a birthday party is to make your child feel special. After all, it is their special day. When the kids leave happy and excited, do you really think they're going to go home to their parents and rave about how tidy your house was, or how perfectly-executed the game of 'pin the tail on the donkey' was? Sit down with your child well before the birthday party and work out what kind of party they want. Do they want a pirate party? A princess party? A tea party? You may be pleasantly surprised at how simple your child's request may be. Regardless, a simple theme can make all the difference. 2) Never work alone. Managing cake, presents, activities, potty breaks, and more at a child's birthday party can leave you stressed and can open the door to accidents. Chances are there's at least one parent who's nervous about their child being alone at a birthday party. Invite that parent over and let them help. Ask them to assist with games, pouring drink and take care of any unforeseen boo-boos. Be sure to send a nice thank you after the party to show how much you appreciate the help and even offer to do the reciprocate at the helpful parent's party as well. 3) Mind you manners. If you aren't going to invite your child's entire class, NEVER have your child hand out invites at school. In fact, many schools and preschools have rules to this effect. If you are inviting an entire class, always be sure to get an accurate class list to ensure everyone gets invited to the party. As soon as the invites are handed out, start talking to your child about the party and how they should and should not act in certain circumstances. For example, if you child receives a gift that they already have, they can tell their friends how excited they are to have two! Try to keep a list of all presents and have your child assist in writing personal thank-yous to all who were at the party. Even if you don't keep a gift list, thank-yous are a must to ensure goodwill. 4) Have plenty of activities on-hand. One of the single most effective ways to ruin a birthday party is with bored children. You have to keep all children occupied from the moment they arrive at the party. When kids start trickling in, have some toys, such as blocks, cars, etc., at the ready. Once all the children have arrived at the birthday party, then you can bring out the birthday party themes and games. Always be sure to have enough to keep every kid participating and happy. If things start to get rowdy or out-of-hand, take a step back from the game and announce a story time where kids can be the characters. For younger kids, a simple craft will often scale back the wildness and give a much-needed breather to parents. Keeping these four simple tips in mind can make the difference between an average birthday party and one that kids will talk about for a long time. Born in Brooklyn and raised in the tough projects of East New York, the sister-team Staci Douglas and Kim Mack watched their own families grow and began raising their six children together. Always a very close family, birthdays are big celebrations. In an effort to celebrate these birthday milestones affordably http://www.outoftheboxparty.com/ was born. For gift ideas you can: go to my website Bright Gift Ideas, go to Gift Guides USA for a comprehensive collection of gift guides, or go to Great Online Deals for coupon codes, discounts and free shipping offers. This is the original home video the BMW advert used. I didn't realise the kids were so happy about getting a Nintendo 64! Shows how long ago this was! The great thing about this toy is that they'll come back to it as they discover new things and the toy develops. The way it works is that you put in the baby's birthday. The toy then actually changes the games based on the baby's age. As developmental milestones are reached the tunes changes, the games change and the top actually pops up, enabling more things to play with. As with all babies, our son played with it and then moved on to something else; but because this changed as he did, he kept coming back to it. Nurture and challenge baby's evolving skills with this interactive toy. Toy changes shape and evolves to meet baby's developmental needs. Stage 1 (4 – 8 months): Stimulates baby's motor skills; wobbles, plays music and flashes lights when baby bats. Stage 2 (9 – 11 months): Refines baby's motor skills; more switches and knobs become active, encouraging development of "pincher-grasp" (thumb & finger). Stage 3 (12 – 17 months): Tower pops up to reveal 5 new switches and toggles; leads baby through Find the Color game. Stage 4 (18 – 36 months): Shapes release from tower for sorting activity; Shape Sorter game becomes active; new light shows and sounds effects become active. Baby-friendly knobs and switches. Wobbly base encourages early batting. Separate pods for pushing, pulling, twisting, flipping, sliding and pressing. Free play with 21 knobs, switches, toggles and buttons. Games include Play with the Pod, Find the Color and Shape SortingTower pops up to reveal new activities. Adjustable volumeBuilt-in clock automatically adjusts activities to baby's development level. Activities at each of baby's four developmental stages prepare your child for the next stage. From the earliest gross motor skills to advanced fine motor and cognitive skills, this toy grows with your child and delights at each adorable stage. This blog's theme is gifts for kids. And especially gifts for kids from people who don't have kids. That's not just people who haven't yet had kids (or have decided they never will), but older friends, aunts, uncles, grandparents etc. who don't have much idea what's out there. We will be featuring individual gifts (not just toys!) and we will cover all age groups.